But before we can discuss customer service standards, we first need to identify and understand the different customer groups. External Customers: Those who purchase a product or service. For each of these customers groups, there are behaviors that can add to a positive service experience. 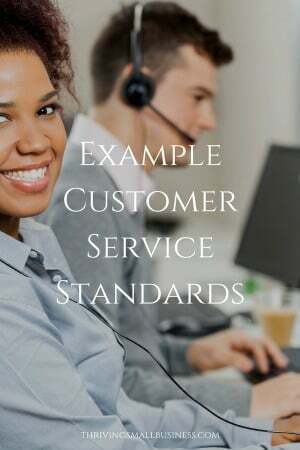 Following are some examples of service standards of behavior that will affect (if consistently demonstrated) great customer service. Many of these standards can have measures attached to them for performance appraisal purposes. This example can be used as a training tool and should be reviewed with the employee. As with many training tools, it is always good to have the employee sign a copy and keep it in their file so there is a record that the expectation was discussed. We will identify ourselves when we answer. I have read and understand the above Service Standards. I also understand that it is my responsibility to comply with the standards and that my performance appraisal will reflect my compliance. Taking care of all customer groups is key to business success. Investing the time to create service standards, and holding employees accountable for adhering to standards, is a basic management practice that should be incorporated into a structured performance management process. Very important topic and it explains clearly. It’s really helpful. Good job.